Q: You're a week away from practice starting. How does it feel to be getting ready to play football again? A: It feels great. I'm getting really excited to be back with my teammates on the field, be back in camp. Being out last year I was able to learn a lot and see a lot of things off the field that will help me on the field. That helped me with my leadership, also. Q: Body-wise, have you changed from before the injury? A: I'm bigger. My upper body has gotten a lot bigger. And the strength and conditioning staff and training room staff have done a terrific job of trying to get my lower body back where it was. But I've definitely gotten a lot stronger in my upper body. I've gained five pounds, and I have lost any speed but I've gained a lot of power. Q: What do you weigh right now? Q: What did you weigh before the injury? Q: So you've got five extra pounds to stick it in there between the tackles when you lower your shoulder, right? A: Yeah. I figure it will help a lot on the goal line. On third-and-1, fourth-and-1, that will really help us. Q: Can you talk about how important it was being able to go through spring practice and be confident coming into the fall? A: That was really an important part for my confidence, what I was able to do during the scrimmages. In one of the scrimmages I had a really big run that boosted my confidence and really showed me that I'm back on the road to being where I once was. Just being able to take hits and seeing if I could pick up blitzes, and being able to take the lead as far as my teammates go. Q: How important is it for you guys to establish more of a running game this fall? A: It's very important. We have a great quarterback (Thaddeus Lewis), one of the best in the nation. And I think if we're able to establish a running game like we should, we'll be able to take a lot of the load off him, and with me coming in and we have a lot of guys that are pretty good out of the backfield, that will help him also and relieve some of the pressure off him. Q: You've been around football now for a while. How is your pass protection and route running? Are you ready to do that at a higher level than you were a couple years ago? A: I'm definitely a lot better as far as pass protection. That was probably the weakest part of my game. I really saw that improve in the spring a lot, and I guess a lot of that comes from being off and being able to study a lot of things, studying what players can do and what to practice. I think that really helped me, and running routes has really helped. We go out every now and then and run a couple of routes, and I'm getting better. RALEIGH - Duke already has a second-team All-ACC quarterback returning in senior Thaddeus Lewis. Coach David Cutcliffe is hoping a better rushing game will complement Lewis' proficiency with the passing attack. "We can run better on offense," Cutcliffe said Thursday night at the Duke football tour's stop in Raleigh. It would be difficult to get much worse. No Duke back rushed for more than 400 yards last season. Backs Jay Hollingsworth (3.7), Clifford Harris (3.5) and Tony Jackson (3.4) all averaged less than four yards per carry. Fifth-year senior Requan Boyette could change that. "Requan is a competitive back, a really powerful back that has good speed," Cutcliffe said. Boyette is returning from a torn knee ligament that caused him to miss all of last season. Cutcliffe said Boyette still needs to learn to run away from linebackers and defensive backs when he gets past the line of scrimmage instead of trying to run over them, but is encouraged by Boyette's play in the spring. - Senior linebacker Vinny Rey's omission from the preseason All-ACC team was "a travesty," according to Cutcliffe. Senior defensive tackle Vince Oghobaase was the only Duke player on the preseason team. "There's not a better one out there," Cutcliffe sid of Rey, "and he's a tough, heartbeat kind of guy." - Although Duke's offensive line returns just two starters, Cutcliffe is encouraged by that unit's progress. "Our offensive line as a unit improved more than any other unit on our team during spring practice," he said. - Female fans in particular will appreciate the renovated rest rooms at Wallace Wade Stadium, whose rest room facilities had been woefully inadequate. "We can seat about 100 of you at a time (in the rest rooms), and it's nicer than home," Cutcliffe said. ". . .but don't stay in there long, because we're going to score while you're in there." GREENSBORO - Linebacker Nate Irving's key doctor appointment isn't scheduled until mid-August, but the N.C. State coaching staff has had to develop a contingency plan for his absence. Coach Tom O'Brien revealed on Monday that Irving's broken leg was a compound fracture, and that his collapsed lung came as a result of being pierced by a broken rib in a car crash in late June. These are serious injuries that will take time to overcome, even though O'Brien has deemed Irving's football status as "out indefinitely" until he knows the results of the August appointment. "He's lucky to be alive," O'Brien said. O'Brien also discussed for the first time Monday the Wolfpack's plan at linebacker during Irving's absence. N.C. State plans to give sophomore Dwayne Maddox the first shot to replace Irving at the boundary linebacker position. Maddox replaced Irving last season, when he missed about a quarter of the season because of various injuries. Maddox struggled as a starter, but usually made good reads and positioned himself well. He just lacked the strength and confidence as a freshman to finish plays against stronger players. N.C. State defensive coordinator Mike Archer said Maddox has improved. "This becomes Dwayne Maddox's time," Archer said. "Because everybody wants to say this and that. Dwayne played pretty well for us last year as a freshman. And he played pretty well in the spring. You could see him making strides." If Maddox can handle the job, that will allow returning starter Ray Michel to stay at middle linebacker. Sophomore Audie Cole - who has received rave reviews from the staff for his play during the spring - will replace 2008 senior Robbie Leonard at field linebacker. If Maddox struggles, N.C. State has other options. Sophomore Sterling Lucas, who played well as Michel's backup last season, could start and allow Michel to move to Irving's spot. Promising redshirt freshman Terrell Manning could play at field linebacker and allow Cole to be moved. The good thing for the Wolfpack is that it has developed enough depth to have decent options in the event that Irving is out for an extended period. But Irving still will be one of the best defensive players in the ACC whenever he is healthy. He will be missed if he can't play. "Something good is going to happen to him," O'Brien said. "He had a bunch of bad luck last year with the high ankle sprain. And now this thing. So whenever he gets back, whether it's this year or next year, he's going to be a great player. Something good is going to happen to him." GREENSBORO - N.C. State coach Tom O'Brien wasn't happy to see the Wolfpack's game with rival North Carolina scheduled for the last week of the 2009 season. “I think it's a dumb game to play at that time of the year, because you're crossing divisions,” O'Brien said Monday at the ACC media kickoff. Since the ACC expanded to 12 teams in 2005, N.C. State has been in the Atlantic Division, while North Carolina has played in the Coastal Division. The division winners meet in the ACC championship game on the Saturday after the regular season concludes. That means N.C. State could meet North Carolina in the ACC title game Dec. 5 in Tampa the week after the teams' scheduled Nov. 28 meeting in Raleigh. Although a championship game meeting seems unlikely this season after the schools were picked to finish third in their respective divisions in the preseason media poll, O’Brien doesn’t want to take that chance. O'Brien voiced concern about the same issue last season, when N.C. State played cross-divisional foe Miami in the finale. That game did not have an impact on the ACC championship race. North Carolina coach Butch Davis seemed unconcerned about when the rivalry game is scheduled, but ACC associate commissioner Michael Kelly, who creates the football schedule, shares O'Brien's concern. In a perfect world, Kelly said, ACC teams would play only division rivals or nonconference opponents in the final week of the regular season. But Kelly said scheduling is complicated. Schools set their own four-game nonconference schedules, and the ACC tries to accommodate one specific scheduling request for conference games for each school. After those criteria are met, the remaining matchups and sites for that particular year are entered into a computer program that generates potential schedules. Kelly said there isn't an option that satisfies everybody on every week. He said the benefit of the North Carolina at N.C. State date is an opportunity for a good crowd, even though the game is on Thanksgiving weekend when many students will be home on break. Other in-state rivalries such as Clemson-South Carolina, Florida State-Florida and Georgia Tech-Georgia traditionally are played late in the season, but those are nonconference games. Kelly said there is no plan to make N.C. State-North Carolina an annual staple at the end of the schedule. In order for North Carolina to play N.C. State on the final weekend, the Tar Heels' traditional season-ending meeting with Duke had to be moved. Forty-two times in the last 44 years, Duke's final regular-season opponent has been North Carolina. The teams will meet on Nov. 7 in Chapel Hill this season. Duke sports information director Art Chase said the benefit of having students from both schools participating in the rivalry week activities outweighed Duke's concerns about moving the game from its traditional date. Since 1983, there has been just one season when Duke and North Carolina finished with a winning record. With that in mind, North Carolina sports information director Steve Kirschner said, his school's administrators have long thought the rivalry with Duke would generate more fan interest earlier in the season. Kirschner said North Carolina fans are excited about playing the Wolfpack last. Davis didn’t seem troubled with the date of either of North Carolina’s rivalry games. “It wouldn't matter if we played both of them back-to-back weeks one and two, they're going to be huge, monumental games with their fans and our fans,” Davis said. “So, whether you end the season with them or play them in the middle of the season, it really doesn't matter." The preseason All-ACC team won’t dampen the already high expectations for North Carolina’s defense, which returns nine starters. Tackle Marvin Austin, linebacker Quan Sturdivant and cornerback Kendric Burney all were voted to the preseason All-ACC team by the media that cover the conference, according to a news release issued Wednesday. No other school had as many players on the preseason All-ACC defense. N.C. State end Willie Young and Duke tackle Vince Oghobaase also received preseason All-ACC defensive honors. N.C. State quarterback Russell Wilson was the lone player from a North Carolina school on the preseason All-ACC offense. C.J. Spiller, who’s being promoted for the Heisman Trophy by Clemson, was voted All-ACC at running back along with returning ACC player of the year Jonathan Dwyer of Georgia Tech. Spiller also was named preseason All-ACC as a specialist and was joined on the team by Tiger wide receiver Jacoby Ford. Offense: QB Russell Wilson, N.C. State; RB Jonathan Dwyer, Georgia Tech; RB C.J. Spiller, Clemson, WR Demaryius Thomas, Georgia Tech; WR Jacoby Ford, Clemson; TE Greg Boone, Virginia Tech; OT Jason Fox, Miami; OT Anthony Castonzo, Boston College; OG Sergio Render, Virginia Tech; C Matt Tennant, Boston College, PK Matt Bosher, Miami. Defense: DE Jason Worilds, Virginia Tech; DE Willie Young, N.C. State; DT Vince Oghobaase, Duke; DT Marvin Austin, North Carolina; LB Dekoda Watson, Florida State; LB Quan Sturdivant, North Carolina; LB Alex Wujciak, Maryland; CB Ras-I Dowling, Virginia; CB Kendric Burney, North Carolina; S Morgan Burnett, Georgia Tech; S Kam Chancellor, Virginia Tech; P Travis Baltz, Maryland. GREENSBORO – N.C. State coach Tom O’Brien has a well-deserved reputation as a straight shooter. He hasn’t been afraid to build expectations for his team. Before his first season with the Wolfpack in 2007, O’Brien said he thought the team had enough talent to reach a bowl game. An incredible rash of injuries helped prevent that from happening until 2008, when the team lost to Rutgers in the Papajohns.com Bowl. Now that N.C. State has been to a bowl, O’Brien is raising expectations again. No coach is going to tell you how many wins his team should have, and O’Brien is no exception. But while some coaches are afraid to build expectations their teams might not fulfill, O’Brien projects confidence in his team. - O’Brien’s counterpart at North Carolina, Butch Davis, also projected optimism even though his team lost three huge playmakers in wide receivers Hakeem Nicks, Brandon Tate and Brooks Foster. Davis is encouraged that the Tar Heels are building depth in his third year. Although Shaun Draughn is the starter at running back, Davis said he won’t feel bad if Ryan Houston or Jamal Womble gets called upon to start a game. He didn’t have that kind of positive vibe about any of his running backs in 2007. “Two years ago, if we would have flipped a coin I don’t know if we had a running back that we felt good about,” Davis said. - Clemson’s 14 first-place votes (out of 87) in the preseason media poll were quite a surprise. The Tigers have the ACC’s most exciting player back in C.J. Spiller and have lots of speed on defense. But there’s no evidence they have improved the lack of toughness that proved to be a huge problem last season, and coach Dabo Swinney is quite inexperienced. The other shock was that Virginia Tech quarterback Tyrod Taylor received only one ACC player of the year vote. Sixty-nine of the 87 voters in the poll picked the Hokies to win the conference, but just one voter picked the projected champion’s big playmaker to be the player of the year. - Former North Carolina offensive coordinator Gary Tranquill is back in a high-profile role coordinating Boston College’s offense. Tranquill, who ran North Carolina’s offense from 2001-05, didn’t coach in 2008 but started his coaching career in 1962. He gives new Boston College coach Frank Spaziani, who’s been a defensive guy, a reliable, veteran presence on the other side of the ball. “I’m very relieved that Gary’s there, because he has a lot of experience,” Spaziani said. - For the first time in several years, the ACC has an impressive array of returning starters at quarterback. Four guys at North Carolina schools – Russell Wilson (N.C. State), Thaddeus Lewis (Duke), Riley Skinner (Wake Forest) and T.J. Yates (North Carolina) are among the headliners. Over the past 33 years, the ACC media has correctly predicted the football champion 21 times. That's not a bad record, even if you take into account that Florida State was an obvious pick 11 years in a row and won the title in 10 of those. Still, the media isn't always right (Really! It's true!) and among the surprises have been some real shockers, Tuesday's Top Five. 5. Clemson, 1981 — The Tigers got a handful of first-place votes, but the media cognoscenti leaned heavily toward North Carolina (65 votes) and Maryland (three votes, but second on points). Clemson didn't just win the ACC. The Tigers won the national title with a win over Nebraska in the Orange Bowl. 4. Virginia Tech, 2004 — Perhaps the ACC underestimated the Big East, but in retrospect it did look like a rebuilding year in Blacksburg. The Hokies were picked sixth (and Miami second) in their first year in the league, but Tech won eight straight down the stretch before losing in the Sugar Bowl. 3. Virginia and Duke, 1989 — The smart money was on Clemson, which had won three straight ACC titles, with the Cavaliers picked to finish third and the Blue Devils fourth. The two ended up tying for the title, with Virginia winning the tiebreaker. 2. Maryland, 2001 — Very little was expected from Ralph Friedgen in his first year at Maryland, but he rallied the Terps to a 7-1 ACC record and a berth in the Orange Bowl. All that after being picked to finish seventh, ahead of Wake Forest (which finished tied for seventh) and Duke (which finished ninth). 1. Wake Forest, 2006 — The Wake Forests and Dukes of the world were supposed to be squashed by expansion, but in the second year of the two-division scheme the Deacons won the Atlantic Division, won the ACC Championship Game and made an appearance in the Orange Bowl — all after being picked to finish dead last in the Atlantic. GREENSBORO — Phase One of UNC's Kenan Stadium renovation -- which included adding a fifth floor to the Kenan Football Center, and renovating the other four levels — will be complete within the next few weeks. Phase Two remains on hold for economic reasons. But when it resumes, coach Butch Davis said, it will likely involve adding club seats and an academic support building to the East end zone instead of the south side of the stadium, which was previously being discussed. The project is still in the planning stages. Last year, Wake Forest had to rely on its defense to win games because the offense, which underwent a couple of in-season scheme changes, rarely found a rhythm. After the loss of defensive stars Aaron Curry and Alphonso Smith, it may fall to the offense to help the defense this fall for the Deacons. “Our offense put our defense in some terrible situations last year,” head coach Jim Grobe said. “We asked those guys to do too much because we weren’t very good offensively. One encouraging sign, Grobe said, is the overall team speed which may be the best in his nine seasons at Wake Forest. In May, Clemson coach Dabo Swinney went to Texas where he spent some time with Gene Stallings, who coached Swinney when he played at Alabama. They spent a weekend together but it was the advice Stallings gave Swinney as he was leaving that has stayed with him. When last season ended, Wake Forest coach Jim Grobe thought rising senior Kevin Harris was set as the starting running back this season. Now, Grobe isn’t so sure. Harris rushed for 136 yards in the Deacons’ EagleBank Bowl victory over Navy, the best rushing performance of the season for Wake Forest, which struggled to find offensive consistency. In spring practice, however, the picture went fuzzy again. “(Junior) Josh Adams had our best spring, Brandon Pendergrass (sophomore) was second and Kevin was third best,” Grobe said. Tigers coach Dabo Swinney said Monday that he’s settled on a starting quarterback this season before the start of preseason drills, which begin next week. “His name is Kyle Korn,” Swinney said, taking the first name from Kyle Parker and the last from Willy Korn, the two players competing for the job. As if Swinney didn’t have enough to deal with entering his first full season as the Tigers’ head coach, he must monitor the competition between Korn and Parker. The good news, Swinney said, is his two quarterbacks have more similarities than differences. Parker has a stronger arm, Swinney said, but both are capable of making the necessary passes and both are effective runners. Swinney said he is resigned to using two quarterbacks this season. “We have too many competitive drills to resigned to that,” Swinney said. “And whatever decision we make will not be final. That guy still has to go out and play. Other than Norm Snead in the 1960s and '70s, Wake Forest quarterbacks have had very little success in the NFL. Karl Sweetan bounced around with a few teams in the late '60s and Mike Elkins stayed on the Kansas City roster for a couple of seasons in 1989 and '90, but the school's all-time passing leaders basically have never been deemed strong professional prospects. Current standout Riley Skinner likely will fall into that same category, but NFL scouts gradually have begun to take notice of his three-season stat sheet — 34 touchdown throws, almost 7,000 yards and a completion percentage (67.3) better than Matt Schaub compiled at Virginia, Philip Rivers at N.C. State and Matt Ryan at Boston College. "It would be something I never expected, of course," Skinner said Sunday of his NFL chances. "But I never expected to be a starter in college, either. It's no secret that I've always been a long shot." But Skinner is bigger (6-1, 210) than some fans probably think, and his leadership record is impressive. And if Deacon coach Jim Grobe and offensive chief Steed Lobotzke make good on their stated intention to standardize the playbook, Skinner will do more pro-style pocket passing than at any time during his career. During most of his eight years at Wake, Grobe has favored a lot of mis-directional, off-beat tactics that have included much play-action passing and a fair amount of quarterback running. GREENSBORO — Florida State coach Bobby Bowden said he hopes he gets to keep the 14 victories the NCAA wants to strip from his record as punishment for academic fraud (which allegedly involved 61 Seminoles athletes cheating on an online course). But if he doesn't win his appeal, he said, "I'll be just as motivated." Entering the season, Penn State coach Joe Paterno, 82, boasts 383 career victories, the most in major college football history. Bowden, 79, is one behind at 382. GREENSBORO - N.C. State coach Tom O’Brien is prepared for the possibility that quarterback Russell Wilson will play just one more season for the Wolfpack football team. Wilson, a first-team All-ACC selection as a redshirt freshman last season, is on an accelerated academic schedule and on track for graduation in the spring of 2010. He also is a baseball prospect who’s eligible for the 2010 draft. O’Brien said family health issues – Wilson’s father suffered a stroke about a year ago – could factor into his decision. With Wilson’s future uncertain beyond this season, O’Brien plans to play highly touted redshirt freshman backup Mike Glennon for a series in the first half in each game. - Tight end Matt Kushner is at full strength after recovering from a knee injury last season. O’Brien said safety Javon Walker, who’s also coming back from a knee injury, might not be ready for the start of preseason camp. But Walker is closer to being ready than wide receiver Donald Bowens, who’s out until at least October while recovering from knee surgery. - Linebacker Nate Irving’s collapsed lung came as the result of a puncture by a broken rib, O’Brien said. O’Brien supplied more detail on the injuries Irving suffered in a one-car wreck in June. Originally, N.C. State announced that Irving had a broken leg and a collapsed lung. O’Brien said the leg injury was a compound fracture, and Irving also separated a shoulder. Irving is out indefinitely, and O’Brien expects to know more about his status after a mid-August doctor appointment. If Irving is cleared at any point this season, O’Brien plans to play him because he is not eligible for a redshirt. - N.C. State is playing two Football Championship Subdivision opponents (Murray State and Gardner-Webb) because of moves to accommodate a three-way scheduling plan calling for East Carolina to play the Wolfpack or North Carolina – but not both – each season, according to O’Brien. East Carolina visits North Carolina on Sept. 19. O’Brien said having two FCS opponents will be a plus financially because it gives N.C. State eight home games in difficult economic times. GREENSBORO -- Virginia Tech has won three conference titles since joining the ACC in 2004. The assembled media in Greensboro made the Hokies' the favorite to win a fourth title in 2009. Virginia Tech received 78 first-place votes, out of 87, to win the Coastal Division and 69 to win the conference title. Order has been restored to the preseason media picks, for the 17th time in 18 years in the ACC, Florida State was picked to at least win its division. The Seminoles received 56, out of 87 first-place votes, to win the Atlantic Division, followed by Clemson (with 14 first-place votes), N.C. State (10) and Wake Forest (seven). Georgia Tech (nine) was on the only other team to receive a vote in the Coastal. GT running back Jonathan Dwyer was named the preseason Player of the Year, edging Clemson's C.J. Spiller, 39 to 28. Wolfpack quarterback Russell Wilson was third with 16 votes. GREENSBORO - Donald Bowens, who was N.C. State's leading receiver in 2007, is out at least until October while recovering from knee surgery, coach Tom O'Brien said at the ACC media kickoff. Bowens missed the 2008 season because of a stress fracture in his back and missed spring practice because of the knee injury. O'Brien said wide receiver still should be a position of strength for N.C. State with veterans Owen Spencer, Jarvis Williams and T.J. Graham returning. "There's some guys there that have stepped to the front," O'Brien said. Bowens made 41 catches for team highs of 598 yards and three touchdowns in 2007. O'Brien said he will face the same challenges as running back Toney Baker did last year in getting back on the field after returning from injury. Baker missed all but one game of the 2007 season and the entire 2008 season because of a knee injury, but is back in 2009. "To get back on the field, (Bowens) has got to be a functional player," O'Brien said. The last time I played golf about 10 years ago, my ball hit some type of vegetation in addition to grass (trees, bushes, etc.) on the first seven holes. So while the coaches and many of the other media members are playing golf Monday morning, I’m reviewing my notes. Here’s a second-day recap of some odds and ends from Day One of the ACC football media kickoff. - N.C. State defensive end Willie Young tried fishing one of the ponds on the Grandover golf course with a fly rod and a blue dragonfly, but didn’t have any luck. Young was one of the most entertaining personalities at the opening day of the media kickoff. He sent a room full of TV reporters into a tizzy by telling them he’d seen linebacker Nate Irving sprinting to catch a bus on campus recently. Irving is recovering from a broken leg and collapsed lung. N.C. State sports information director Annabelle Myers quickly explained to the TV folks that Young was joking. The quote of the day also might have come from Young. Nobody at the table had any idea what Young was talking about. But it was interesting. - It’s fashionable to predict that Georgia Tech’s flexbone offense will be less effective this season now that defensive coaches are more familiar with it. Running back Jonathan Dwyer, the returning ACC player of the year, didn’t sound the least bit concerned about that as coach Paul Johnson begins his second season. Dwyer said Georgia Tech’s playbook will expand significantly this fall. That can’t be good thing for opposing defensive coordinators. - Clemson’s life-sized poster promoting running back C.J. Spiller for the Heisman Trophy was a bit of old-school marketing genius by school sports information director Tim Bourret. Embracing new technology, college sports marketers now often set up web-based promotions for their athletes. By doing a print-based campaign on the 25th anniversary of Clemson’s promotion of William Perry, Bourret set his player apart from the dot.com crowd. With the last two Heisman winners, Tim Tebow and Sam Bradford, still playing, Spiller probably doesn’t have much of a chance at the trophy. But Bourret still made his player the talk of Greensboro on Sunday. His only cost will be about $1,000 in postage to send some posters to the media. Two sponsors split the $10,000 cost of printing the 4,700 posters. Judging by their popularity, more sponsors and additional printings are likely. - ACC officiating supervisor Doug Rhoads said a new NCAA rule will allow both the home and road teams to wear their dark jerseys in a given game if the colors of the jerseys are significantly different. The rule came about after Southern California accepted a 15-yard penalty to start the game in order to wear its dark jersey along with rival UCLA last season. In order to make that penalty void, both teams must agree in writing before the game that neither team will wear white. Last year’s new timing rules implementing an NFL-type 40-second clock resulted in shorter games by an average of 12 minutes and nine snaps. Rhoads said the NCAA is pleased with how the changes sped up the game. ACC crews stopped play for replay reviews 184 times last season for an average period of 1 minute, 24 seconds. Calls were reversed 46 times. Rhoads said that’s on par with the national average of one reversal for every four stoppages. - For the second time in three years, the ACC’s lobbying for an early signing date for football recruits has failed to generate support. ACC commissioner John Swofford said the early signing date, which had been proposed for December, would have saved money. He said it would have saved coaches the expense of continuing to travel and continue recruiting players who gave non-binding commitments months earlier. Swofford said he understands the opposition to the early signing date, though. A worst-case scenario could have a whole class of players signing in December with a school that fires its coach in January – after a loss in a bowl game. The coaches meet with the media beginning at 3 p.m., so we’ll have more for you then. Eugene: Pack QBs a 'luxury"
GREENSBORO - N.C. State running back Jamelle Eugene said having first-team All-ACC player Russell Wilson and promising redshirt freshman Mike Glennon at quarterback is a "luxury" that the Wolfpack hasn't had in a long time. "It's great," Eugene said Sunday at the ACC media kickoff. "We've been struggling to have one (capable quarterback) for the last few yearas. We had a guy here or there. And kinda. And not really. And now we have one certified (Wilson) and another who looks just as good (Glennon)." Eugene said Glennon's arm is comparable to Wilson's. "They can both throw it, easily, probably 70 yards," Eugene said. "They can throw the rock, and they can throw a nice, tight spiral. Their accuracy is great. They have two kind of different deliveries. Russell is free lance and Glennon is textbook, but they both have great arms." Will Georgia Tech offense go global? There are some who doubt whether the spread-option offense used by coach Paul Johnson can be as effective in his second season at Georgia Tech as it was last fall when the Yellow Jackets won nine games, including a regular-season finale over Georgia. Running back Jonathan Dwyer, the ACC’s player of the year after rushing for 1,395 yards, expects it to only get better. “He told us that people would say it wasn’t going to work and that only motivated us to prove people wrong,” Dwyer said. “He’s the man. He’s the guru. Some guys are going to be coming to see what he’s doing. We have high school coaches coming from all over to see what we do. Florida State linebacker Dakoda Watson has listened and read all about the controversy swirling around Seminoles’ coach Bobby Bowden and whether the NCAA will force him to relinquish 14 victories due to rules violations. Bowden has 382 career victories, one fewer than Penn State’s Joe Paterno in the race to be college football’s all0-time winningest coach and the loss of 14 wins would end any chance of Bowden eventually overtaking Paterno since the Florida State coach will step down after this season or next. “Bobby Bowden told me he doesn’t care about those games,” Watson, a former Aiken (S.C.) High star, said. “Even if they take those games, he’s still Bobby Bowden. Quarterback Christian Ponder also came to the defense of his coach. “A lot of people think he’s not as involved as he was but he’s still very involved,” Ponder said. “He contributes a lot. By the time Wake Forest quarterback Riley Skinner was a senior at the Bolles School in Jacksonville, Fla., football recruiting fans already knew all about an in-state junior named Tim Tebow. It was Skinner’s team, though, that nipped Tebow’s for the conference championship in 2004. While Tebow has grown into a college football legend, Skinner has helped redefine Wake Forest football, leading the Deacons to 28 wins the past three seasons. In the process, Skinner and Tebow have remained friendly. “I see him playing golf in Jacksonville most summers,” Skinner said. “We say hello when we’re together. We did some banquets together when we were in high school. “Our families know each other. He’s a super-nice guy, a class act. When we won the conference championship (in ’04), his dad called my dad to congratulate us. Despite winning a state championship as a senior, Skinner drew little interest from college recruiters. He was considering attending Georgia as a regular student (his mother and sister went to Georgia) until a late offer from Wake Forest. Clemson running back C.J. Spiller is into wristbands. “They’re my tattoos,” Spiller said Sunday at the ACC Football Kickoff. Only easier to put on and much easier to take off. Spiller has three on each wrist – pink, yellow and orange on his left wrist, orange, yellow and white on his right wrist. Each has its own message. There’s one that says, ‘Dabo’s All-In Team,’ a reference to coach Dabo Swinney’s mantra. GREENSBORO - Earlier this week, North Carolina coach Butch Davis said he’s looking for some big playmakers to step forward now that wide receivers Hakeem Nicks, Brooks Foster and Brandon Tate are gone from the 2008 team. At the ACC media kickoff on Sunday, quarterback T.J. Yates identified two skill players who’ve demonstrated in offseason workouts that they’re ready to make big contributions. Yates said Shaun Draughn has taken the raw talent he showed last season and developed into a well-rounded running back with pass catching and blocking skills. Yates said freshman wide receiver Josh Adams, who enrolled early and went through spring practice, immediately impressed his teammates. “He’s been working his tail off all off season,” Yates said. GREENSBORO - Sometimes the smallest improvements can make all the difference for a football program. Quarterback Thaddeus Lewis said renovating the rest rooms at Wallace Wade Stadium should help Duke get better fan support. He said female fans had brought the sorry condition of the rest room facilities before the renovation to his attention. “It was like, ‘Wow, the bathrooms were old and beat up, and sometimes we’d hold it until we came home,’ ” Lewis said fans told him. Earlier this month Lewis worked at Peyton and Eli Manning’s football camp for high school players. He was impressed with how the fundamentals the Mannings teach mirror those of Duke coach David Cutcliffe. Cutcliffe coached both Manning brothers in college. “They have nothing but good words to say about the man,” Lewis said. GREENSBORO — By early fall, tickets for the 2010 ACC football championship game in Charlotte should be on sale, ACC associate commissioner Michael Kelly said Sunday at the ACC media kickoff at Grandover Resort. Kelly expects an announcement on availability of tickets and the structure of the leadership of Charlotte's local organizing committee in September. After the championship is played in Tampa this year, it will come to Bank of America Stadium in 2010 and 2011. GREENSBORO - Somebody told N.C. State defensive end Willie Young that there are ponds on the golf course at the Grandover Resort. Young quickly got out his fishing rod and went to work, according to N.C. State sports information director Annabelle Myers. Young is in Greensboro for the player interview portion of the ACC football media kickoff today at the Grandover. There's no word yet on whether Young caught anything. We'll keep you up to date on that and what Young and the 23 other players had to say at the media kickoff. The kickoff is under way with John Swofford's commissioner's forum. The preseason media poll will be released Monday. Duke reserve defensive tackle Kinney Rucker is out indefinitely because of an injured foot, the school announced Friday. Rucker had surgery last month to repir a torn plantar plate in his right foot. "At this point, we don't have a timetable set for Kinney's return," Duke coach David Cutcliffe said in a statement. "We'll continue to monitor his progress and evaluate the options as his health improves." A native of Durham, Rucker has played all 24 games with four starting assignments over the past two seasons. He made 28 tackles with four quarterback sacks in 2007 and added 21 tackles last season. He was expected to be the top reserve behind senior Vince Oghobaase this season. Injuries suffered in a car crash in June have N.C. State linebacker Nate Irving out indefinitely, coach Tom O’Brien said Thursday afternoon. During his first public media appearance since the June 28 crash, O’Brien said he won’t know more about Irving’s status until after the player’s next meeting with doctors in mid-August. O’Brien said that if and when doctors clear Irving to return to football this season, the coaches will allow him to play because he already has used a redshirt year. But there also is a chance Irving could be out for the season. Irving, who will be a junior this season, suffered a broken leg and a collapsed lung in the wreck. He was cited for careless and reckless driving after a one-car wreck at 4:40 a.m. on Interstate 40 in Johnston County in which a police report mentioned driving while sleepy as a potential contributing factor. He led the team with four interceptions last season and made 84 tackles despite missing about one-third of the season because of injuries. Reserve running back Tony Jackson has been dismissed from the Duke football team by coach David Cutcliffe, the school announced Wednesday. In a news release, Duke announced that Jackson had failed to uphold the standard of conduct expected of a football player at the school. As a sophomore last season, Jackson played in 11 games, starting three. He rushed 76 times for 259 yards and caught 12 passes for 106 yards and one touchdown. Which is state's best football team? Which college football team will be the best in the state of North Carolina in 2009? There are numerous reader comments on the "ECU sets challenge" post that hash, and rehash, that argument. What will happen in '09? We don't know. What has happened from 2000 to '08? We do know. Those numbers say N.C. State has been the best team in the state of North Carolina ... so far. State has won the most overall games (60), ACC games (32), bowl games (four) and has edged UNC and Wake Forest (5-4 against each) in their respective series. The Wolfpack has also had the most bowl appearances (six). (Oh, I hear you, Yosef, App State's got three national titles but your boys are 1-2 against the ACC this decade with a 23-10 loss to N.C. State in '06, which was State's worst team of the decade). Duke (surprise!) has the worst record of the five Bowl Subdivision programs in the state (and all of Division I-A for that matter) with a 14-90 mark. For the sake of meaningful comparison, Duke, has been taken out of the group-record discussion. Notes: State, Wake and ECU have each had four losing seasons this decade. UNC has had five. Notes: Wake Forest won the ACC Championship Game in '06. The ACC only recognizes the regular season (6-2) in their won-loss record. Duke is 4-68. 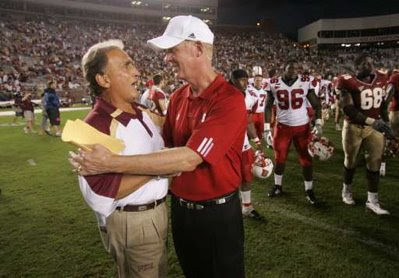 Notes: Wake Forest's only bowl loss was to Louisville in the '07 Orange Bowl — the only BCS bowl appearance of the group. Notes: Of the current coaches, Tom O'Brien (State) is 5-1 against the group, Jim Grobe (Wake) is 13-6, Skip Holtz (ECU) is 2-3 and Butch Davis (UNC) is 0-3. ECU's season-ticket sales have surpassed 20,000 for the 2009 football season, the school announced Thursday. Less than 2,000 season-ticket packages are available and there are no individual tickets for the Appalachian State game (Sept. 5) or Virginia Tech (Nov. 5). That means if you want to see either game, you have purchase season tickets (or the secondary market). ECU could go 0-4 against its nonconference schedule. With App State, UNC, West Virginia and Virginia Tech there is no guaranteed win on the Pirates' schedule. Almost every college football team plays at least one gimme (most play two). Not ECU. Due to the geographic disadvantage of Conference-USA, and relative lack of strength as compared to a BCS league, under AD Terry Holland and coach Skip Holtz the Pirates have annually set up four nonconference challenges. Does ECU play the toughest schedule in the country? No, and that's not the point of Sunday's college football column. As Holtz said: "There are a lot of people who play nobody and then beat their chest and go 'Look at us, we're 11-1,.' "
ECU doesn't do that and that's commendable, whether you're an ECU fan or not. N.C. State linebacker Nate Irving was released from the hospital Friday, school sports information director Annabelle Myers said in an e-mail on Monday. Irving had been taken to the WakeMed Trauma Center in Raleigh after suffering a fractured leg and a collapsed lung in a one-car wreck before dawn on June 28. Myers said Irving planned to spend a few days at home in Wallace, N.C., before returning to campus. The school has yet to release a timetable for Irving's return to football. According to police records, Irving was injured when he drove off the side of Interstate 40 at about 4:40 a.m. on June 28. His vehicle came to rest in a ditch after hitting two trees. He was cited for careless and reckless driving, and the police report cited being tired or sleepy as a possible contributing factor in the crash. Irving, who was expected to be one of the ACC's premier defenders this season, is a junior who redshirted as a freshman. He contemplated leaving school early for the NFL draft, but decided against it. He led N.C. State with four interceptions last season and made 84 tackles despite missing about a third of the season because of injuries. Four players who were expected to be on N.C. State’s 2009 football roster will not be with the team, the school announced Thursday. Coach Tom O’Brien announced that sophomore cornerback Dominique Ellis is transferring. Three players who signed with N.C. State in February – Tyson Chandler, Raynard Randolph and Bryan Underwood – will not enroll in the fall. Ellis played in all 13 games last season. Although he played mainly on special teams, he was considered a promising prospect. "I appreciate everything the N.C. State coaching staff has done for me and taught me," Ellis said in a statement released by the school. "I learned a lot from them, but at this time, I think that for personal reasons, it’s in my best interest to continue my career at another school." Chandler is an offensive lineman who was one of the top prospects in New Jersey. Underwood was supposed to add speed at wide receiver, and Randolph plays defensive tackle.